There's been a torrent of spirited banter lately about the reemergence of downtown central-cities. Much of this raucous debate is between advocates of urban revitalization, who offer an assortment of anti-sprawl messages as justification for this movement, and those who see suburban growth options as essential to quality of life in America. Adding to the fray are environmentalists who see housing density and alternative forms of transportation as the panacea for confronting our carbon-choked world. Downtown central-cities, they say, will incentivize citizens to relinquish their cars in favor of bikes and walking paths. These discussions largely ignore a greater significance to the reemergence of central-cities; namely, the recognition of downtowns as the epicenter of civic and cultural activity. This represents a shift away from the traditional concept – barely a century old and now antiquated – of downtown as predominately an economic and job center hub. Increasingly the word “downtown” has become associated exclusively with large urban centers, fostering images of traffic, crime, homelessness and other forms of unsavoriness. A closer look, however, reveals a wide range of downtown genres – small and large, central-city and suburban, safe and sketchy, chaotic and peaceful, established and emergent. Some downtowns are situated in major urban regions while others are nestled in small-town communities. The senior demographic is prominent in some, college crowd in others. This new assessment of downtown as primarily a center for civic opportunities makes sense and revives the ancient role of the plaza “forum” or “agora” concept–places that H.G. Wells affectionately referred to as ideal for “concourse and rendezvous.” This redefinition may bother some who wish to return to the downtown apex of the 1950s, yet the idea is both viable and sustainable. With the traditional town-center model serving as the hub of civic activities, residents and visitors alike are frequenting dining establishments, arts and music venues, and coffeehouses in the spirit of civic connection and community. No longer a phenomenon exclusively associated with young artists, bohemians, and intellectuals, the downtown experience is also drawing unprecedented numbers of older folks who appreciate the history, cultural significance, ambiance and architecture of the old core. Downtown planning efforts in many locales are responding to this surge of interest by creating a brand identity for their cities – Austin, Texas, has developed a vibrant music scene, with a number of entertainment venues tucked along its 6th street corridor; Indianapolis promotes itself as a spectator-sports mecca, with its downtown activity infused by a robust fan base frequenting college basketball tournaments, pro and minor league baseball games, and the nation's largest sporting event: the Indianapolis 500; Chicago touts itself as a tourist destination replete with world-class museums, city and architectural tours, and fine dining in its vast downtown core. Smaller downtowns in cities like Davis, California, Evanston, Illinois, and Iowa City, Iowa, tap into a bustling college crowd from area universities. Traverse City, Michigan, with a population of over 15,000 (142,075 in the surrounding metro area) offers another model: the quintessential small-city downtown. Quaintly situated along the Grand Traverse Bay on Lake Michigan, the area is primarily known for boating, kayaking, and sailing, except in July, when the city hosts its annual, week-long Cherry Festival that attracts swarms of people to its historic downtown area. According to Rob Bacigalupi, Acting Executive Director of the Traverse City Downtown Development Association, downtown traffic is driven by the office population and events. “Downtown Traverse City has somewhere in the neighborhood of 3,500 office workers. Certainly that's a small number by any measure, but for a town of 15,000, these workers provide a good base for retailers who otherwise have to rely exclusively on seasonal visitor traffic,” he says. For many city leaders the potential impact of downtown on regional economics and culture is what's creating the most buzz. Kansas City (Missouri), Roanoke (Virginia), and Asheville (North Carolina) are among a growing number of cities seeking to capitalize on their unique brand of cultural connection to generate badly needed tax revenues for their downtown areas. Some experts say this is a sound move amid tepid economic times as city and local governments look to draw customers from closer to home. This message rings true for economically ravaged Rust Belt cities like Cleveland, Ohio. For years, downtown Cleveland has struggled to survive – beginning in 1960 when manufacturing and heavy industries began their decline and the flight to the suburbs gained momentum. In 1978, Cleveland had the dubious distinction of becoming the first American city to enter into default since the Great Depression. Despite small glimmers of promise, downtown Cleveland has been stuck in neutral, unable to build a cohesive identity and direction. There are some successes though: Redevelopment efforts have transformed a downtown corridor along E. Fourth Street into a bustling fine dining and nightlife mecca, demonstrating the appeal that well-constituted areas have on the local populaces and tourists. And the area's rich ethnic and cultural heritage shows promise as a catalyst for change in the central core. While all of this points to some progress for downtown Cleveland, it still must overcome a heavy stigma associated with crime, poverty, and a declining population base to truly achieve civic vibrancy. Many of our nation's suburban communities are setting the pace for downtown civic connection. Naperville, a Chicago suburb and the fifth largest city in Illinois, has established itself as a model for suburban downtowns. This city of 142,000 residents features a cornucopia of sophisticated shops, restaurants and entertainment venues that attract foot traffic to the town center-oriented central district. Open space has been integrated into the cityscape through well-maintained walking paths along the DuPage River, which flows through downtown. Thoughtful planning for the provision of abundant, free parking, train accessibility, and bike lockups enables convenient accessibility to the area both day and night. Folsom, California, is indicative of a suburban community that fosters civic ties and activities through its historic downtown district. With a population of 70,000 this city located in the eastern portion of rapidly growing Sacramento County draws an eclectic crowd to its old town boardwalk setting replete with saloons, outdoor restaurants, and antique stores. The downtown core also serves as a gathering post for legions of bicyclists who have helped shape Folsom into one of the top bicycling communities in the nation. 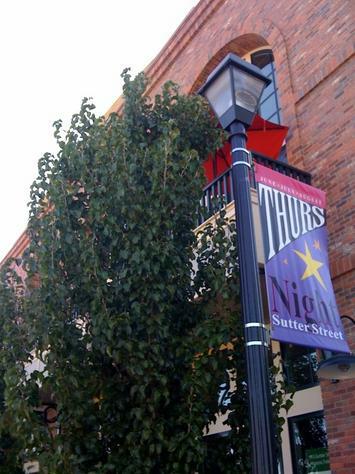 During summer, downtown Folsom hums with activity generated by two weekly events: Thursday Night Market, featuring live music, food and shopping, and the Sunday Farmers Market, where frequenters can purchase fresh, locally grown food from area farmers. Plans are afoot for a street-scape improvement and a storefront restoration – projects that are designed to preserve historic elements while enhancing the city's tourism desirability. Also in the works are mixed-use housing units and a restaurant that incorporates a railroad roundabout. All of this comes on the heels of a new parking structure and ice-skating rink, which debuted last year. In the end, downtown central-cities seem poised to reclaim some of their prominence as magnets of culture and social connection. We may not be witnessing the rebirth of the great economic centers of the 1950s, but a revival of our central space represents a positive development for communities both large and small. Michael Scott is a researcher and writer focusing on the growth and sustainability of downtown central-cities. He can be reached at michael@vdowntownamerica.com. Submitted by Design New Haven on Mon, 08/03/2009 - 09:46. Great article. However, I wouldn't discount those bike lanes. Having visited hundreds of downtowns in Europe, Asia and the U.S., I believe that the revival of downtowns as civic spaces depends first and foremost on their pedestrian accommodations and accessibility to surrounding residential areas via walking, bicycling and transit. For profit tourist corridors or "developments" are not the same as thriving civic spaces where residents of every age, background, culture, income and education come to interact in positive ways. New Haven is not only fortunate to have one of the densest downtowns in the United States, it also benefits from its close proximity to many extremely dense, 19th century residential areas. Most smaller American cities do not have this geography, unfortunately. But instead of trying to reclaim civic life by building up thriving neighborhoods and walkable streets in the surrounding area, they tend to focus on parking garages and tourist infrastructure.